The Disgo 8400G manages to hit in at a very low price point, but this does come at the cost of some of the higher end features and fluidity. However, offering 3G and Jelly Bean for under £150 is impressive. The equivalent iPad Mini is more than twice the price. The Disgo 8400G launched recently, highlighting just how far the tablet PC has come. The modern tablet PC market only kicked off with the original iPad three years ago and it's seen the rise of the budget tab with the Amazon Kindle Fire, Google Nexus 7 and Apple iPad Mini being the most prominent. Why does this mean that the tablet market has come so far though? Put simply, because you can now walk into a shop like PC World, Currys or Amazon, and walk out moments later with a 3G enabled tablet AND change from £150. We know that technology is always getting better, faster, and cheaper, but to put this into perspective, the Wi-Fi and 3G Nexus 7 is available from £239, whilst the Apple equivalent is almost 2.5 times more expensive, starting at a whopping £369. Surprisingly, Amazon has yet to release a 3G version of its Kindle Fire and Kindle Fire HD tablets in the UK, although the aggressively low launch prices (with Amazon looking to recoup on content sales) of £129 and £159 respectively, sent waves through the tablet market. Given its 7.9 inch screen, the Disgo 8400G has been launched against the three biggest names in the tech industry, leaving it very little room for error. Running Android 4.1.2 Jelly Bean from the offset, though, is a very good start. The Disgo 8400G also packs some nifty and exciting features that we will look at later on. 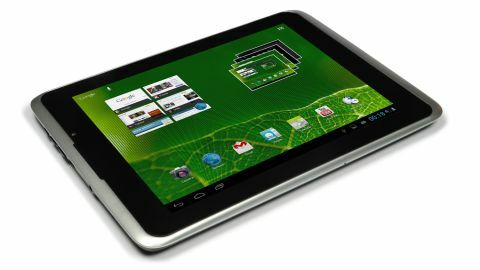 Being a Wi-Fi and 3G enabled tablet, the 8400G has the ability to send and receive text messages, and makes phone calls, a la Samsung Galaxy Note 8.0 and the Asus FonePad. In all then, for sub £150, we're left with an intriguing piece of tech that is using price to make a name for itself against the big guns. Will that be enough? Measuring in at 214 x 155 x 11mm the Disgo 8400G is by no means the smallest of the smaller tablets. The 8400G also weighs in at a rather hefty 460g. This means that one handed use is rather uncomfortable, especially for long periods of time, not ideal if you're after a cheap ereader. Disgo appear to have taken several design cues for the 8400G from one of the Android tablet forebears, the HTC Flyer. Whilst entirely functional, given some of the svelte designs that now adorn the faces of the Nexus 7, iPad mini and even the Kindle Fire, the 8400G is a tad disappointing. Not very well hidden in the top, or left hand side depending on orientation, is a single speaker. Sound playback is respectable, and loud enough to be able to show off your YouTube antics to all your friends. Within the bezel you'll also find the 0.3MP front facing camera for video calling, as well as the iPad Mini matching 7.9 inch 1024x768 display. Disgo's LCD offering doesn't quite live up to Apple's LED, as the viewing angle leaves a lot to be desired and in bright sunlight, the 8400G is practically unusable. Along the top (whilst in portrait) of the Disgo 8400G, you'll find just about every button and port; the microUSB and 3.5mm headphone ports, volume rocker and power/lock button. Alongside these are a microphone, as well as a covered SIM and a well received microSD port. The only exception is left hand side, which houses a microphone port. Having all the buttons on the top is rather awkward, especially if you have headphones or a microUSB cable plugged in. We found that whilst sitting and holding the tablet in portrait mode, our hands covered both the ports, although the buttons were still easy enough to hit. Processor wise, the Disgo 8400G packs in a 1.2GHz dual core Snapdragon S4 as well as 512MB of RAM to keep things plodding along. The 8400G also manages to fit a GPS with A-GPS in, meaning you can turn your tablet into a very large satnav should you desire. Suprisingly, the 8400G does come with a 2MP rear camera for taking photo's with, a bonus given that it's omission would have been seen as a way to keep costs down. Disgo have also provided a 4800mAh battery, is claimed to last 8 hours. Unsurprisingly Disgo have provided the 8400G with Wi-Fi to b/g/n capabilities, and as mentioned earlier, microSD support, up to 64GB. Bluetooth 3.0 is also on offer, however there is no DLNA support.